There is so much to see and do on the Costa del Sol in Andalusia, Spain, it is sometimes hard to decide what to do first. Here are some of the best, and maybe a little out of the ordinary, attractions on offer in the area. You've arrived on the Costa del Sol for a well-earned holiday break. You've unpacked the suitcases and settled nicely in your choice of the best Spain villas available and now want to head out and explore your surroundings. 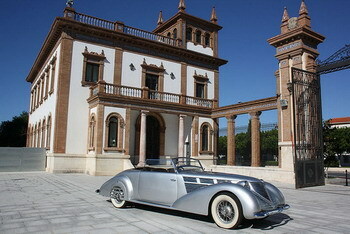 Let’s start with the city of Málaga where a collection of the most amazing vehicles awaits. Lovers of unique classic and vintage vehicles will be in sheer heaven when visiting the Museo Automovilístico de Málaga, but it is also a fun outing for the whole family. The museum is housed in what was previously a Tobacco factory, named Tabacalera. With a floor space of 6,000 square metres available, the museum displays over 85 vintage and classic cars. Each vehicle is contained within a thematic group and by the years in which they were first built, including such exciting themes are Belle Epoque, The 20’s, English Tradition, Eccentricity, etc. To add to the vintage flavor, another display has around 300 fashion hats in a collection dubbed “From Balenciaga to Schiaparelli” and there is also a range of antique luggage on show. Worth around 25 million euros, the car collection is owned by Joao Manuel Magalhaes, from Oporto, Portugal. Apparently his father started the collection, Magalhaes kept up the family tradition and now it is one of the most important vintage car collections in the world. Málaga City spent around 9 million euros renovating the old tobacco factory, making it suitable to house these classic beauties. Next stop on our tour down the Costa del Sol is Benalmadena Costa - a popular seaside resort town with great beaches and an enjoyable Marina. However, just above the town it is possible to get away from all those crazy tourist crowds, by travelling right up to the top of a mountain. Photo: View on Calamorro Mountain CC-by-SA Yulia Kuprina For a day out with a fabulous view, Calamorro Mountain cannot be beaten. Situated at around 800 meters up above the town of Benalmadena, it is possible to enjoy not only 360 degree panoramic views, but also mountain walks, a visit to the Valley of the Eagles and the occasional falconry exhibition or display of Andalusian horses. The Teleférico cablecar takes visitors up to the summit of the mountain, where vistas of the Costa del Sol can be enjoyed on all sides. On a clear day, it is also possible to see across to the Sierra Nevada mountains and the African coast, as well as Gibraltar in the far distance in the other direction. 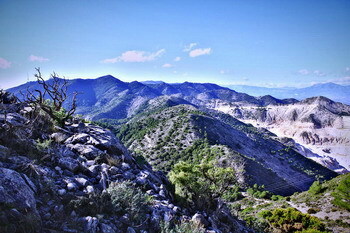 Clearly marked hiking paths lead visitors to various different viewing points, heading through the rocks to where it is possible to see Mediterranean scrubland plants, typical of the region, including Zahareña, Rockrose, Thyme, Lily, Mastranto, Cantuero or Marjoram. The Valley of the Eages offers daily exhibitions featuring owls, vultures, falcons and eagles, flying free in a natural setting while experts offer interesting talks to the public about the various species. A cafeteria offers light meals and refreshments to end off the experience. For an attraction on a much smaller scale, the next stop is located a little inland, up on the hillside above the coastal towns of Fuengirola and Mijas Costa in the charming white-washed town of Mijas Pueblo. 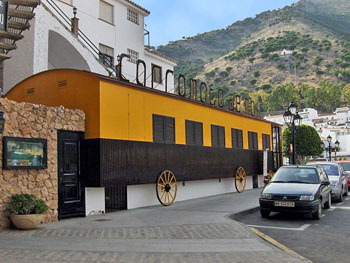 The Carromato de Max is considered to be the world's best miniature museum. It was started by a successful hypnotist, Juan Elegido Millán, whose pseudonym was Professor Max, who decided to settle in the town back in 1972. The museum houses a total of 360 miniature works from over 50 countries, which all go to show that some of the best things do, indeed, come in small packages. Housed in a gypsy-style caravan, it is possible to see wonders like a painting of Abraham Lincoln on the head of a pin, or a teeny-weeny sculpture of Winston Churchill carved from a small piece of chalk, or view an excellent rendering of the Last Supper on a grain of rice. As can be imagined, most of the exhibits can only be seen with the aid of a magnifying glass or microscope, and all are totally fascinating. The museum is located close to the main square in the town and can be reached either on foot, or with the help of one of the traditional Mijas donkey taxis. These, and many more, attractions will keep you wanting to come back to the Costa del Sol every year. Have a great holiday!